This digital drum and percussion kit is developed to resemble, sound and play like an actual drum set at a fraction of the size and weight! This customizable, lightweight and portable instrument kit gives today's modern day spin on the traditional and bulky drum sets. Play the drums to prerecorded sound kits and songs --like soft rock, hard rock, electronic, pop, jazz and much more-- or record your own! MIDI (Musical Instrument Digital Interface) is an industry-standard protocol that enables electronic musical instruments, computers, and other equipment to communicate, control and synchronize with each other. MIDI allows devices like computers, synthesizers, MIDI controllers, sound cards, samplers and drum machines to interact with the unit to exchange system data. Also included is a built-in metronome and 11 pre-set drum kit with up to 4 variations all to help you imitate an actual drum set. The input panel has line-in, line-out, MIDI in, MIDI out, headphone jack, and SD memory card slot. Grab your favorite MP3 files from your computer's media library like iTunes and get ready to rock out. Do more and connect sound input sources like a CD, MD and iPod/MP3 players, computer, microphone, guitar and speakers to get the most out of this professional drum kit! Make use of music production software when you connect this drum kit to your computer. Record your own songs, edit and then share your creation with your friends! The digital sound module comes equipped with LCD screens and a ton of audio configuration controls that will allow to create some truly unique and customizable music. Once you've setup your sounds for the drum pads, you can save the presets and continue to drum from there. Then, when you're ready, hit the record button and create your first drum solo! Pump up the volume and drum for a crowd of family and friends or take advantage of the headphone jack and plug in your headphones for a personal drumming session. The new PED02M electronic drum kit comes complete with an MP3 recorder, making it easy to practice and record from the confines of your own home. No more angry neighbors or upset roommates -- just plug in your headphones and play your heart out. Everyone knows that practice makes perfect. So now you can practice anytime you want, in the comfort of your own home. This compact, all-in-one solution is a drummer's best friend. Complete with five ultra-responsive drum pads, two natural motion cymbal pads, and both hi-hat and bass pedals -- the pads on the PED02M drum kit are so sensitive they feel like real, natural drums. Including 11 pre-set drum kits with up to four variations, the PED02M's 16-bit/44.1 kHz 3D sound quality will leave even the most seasoned and serious drummer in awe. The kit comes with a built-in reverb switch and metronome, an A-B looping function, MIDI in and outs, and of course, the built in MP3 layer/recorder. The kit even comes with a stereo line-in for a portable MP3 devise, so you can practice along with any MP3 or CD. Review : Great starter kit for the kids. Fun to play. Sturdy product. Seems to work well. Review : Nice entry level product!! Work well. Review : great, but the pedal for the bass drum broke. 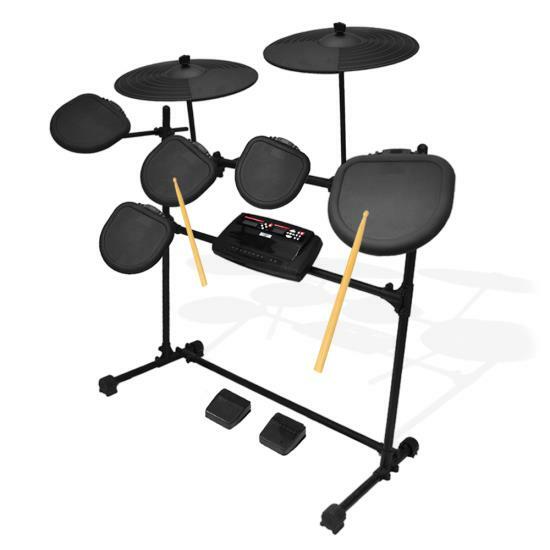 Review : We bought the free standing drum set for my son who is 12. He assembled the entire set and LOVES it! Plays it with his head phones and so far we couldn't be happier. Review : Great and complete product! Review : I was very excited to try this product after reading the many great reviews. Unfortunately, I received it and the unit did not make any sound! I was really hoping to scratch my drummer itch with this item, so I am hoping to get it serviced by the manufacturer ASAP. Review : Great drums for the price. I would have paid twice as much for a similar kit anywhere else. great value..only downside is that the kick drum pedal is too sensitive hitting twice instead of once frequently. but overall a very good value! Review : Set up everything with a very excited teenage boy. Then no sound came out of the device at all. Tried several headphones and instrument speakers. No sound. Review : I received most of the product but there were missing parts. I did not receive the 7 "connector type A" parts - so I cannot assemble the parts. All I want is to receive these parts. Why won't your Customer Service department return my phone call? Review : The product was easy to set-up and user friendly. Review : This is my first electronic drum, and I must say that I am very pleased with the adjustability and tonal variety in a unit in this price range. The only issue I have is with the kick pedal, which is very sensitive and sometimes makes multiple beats when you only mean to hit one. Review : This product for the price is an awesome starter kit for my 7 year old son. One he really enjoys it and my wife and I do not have to hear how bad he is right now. I know with time on this set he will get much better. Review : I recently purchased the electric thunder kit for my 10 year olds birthday gift. To my surprise I quickly became addicted to playing on this set. The sound is amazing. Much better than I ever expected. It is very sturdy as well. I would recommend this product to anyone that wants to get serious or just play around as this kit is great for either one!! Review : Very noce drumset except the pedals are too sensitive so even if you tap it once it will sometimes make 2 beats.